"I see you have brought a card with you, Mr. Okada. Please tell us about your card." The Democratic Party of Japan, the once and possibly future alternative to the ruling Liberal Democratic Party, will today be having a joint meeting of its members of both Houses of the Diet. Though the agenda may have other items on it, there is really only one major topic of discussion: should the current party leader Kaieda Banri be forced to hold an early leadership election? A year ago, after the party's defeat in the House of Councillors election giving Abe Shinzo and his party control of both Houses, Kaieda asked to be given a year to turn party fortunes around. By any measure, he has failed to make even minor progress in that direction. The DPJ is the main opposition party again but only because its potential rivals - the Japan Restoration Party of Hashimoto Toru and Ishihara Shintaro and the Your Party of Watanabe Yoshimi -- have fissioned into ever more strangely-named pieces. Kaieda gained a slight boost from the victory of the anti-Liberal Democratic Party, former DPJ MP candidate Mikatsuki Taizo in the Shiga governor's race two weeks ago. However, in order to win that race Mikatsuki and his many DPJ helpmates pointedly avoiding mentioning the candidate's DPJ ties, worrying that association with the DPJ would torpedo his chances. Sincere and learned, Kaieda has failed to inspire as a party leader. He has little aptitude in playing to the public's or the news media's expectations and foibles. He has also failed to chart the party a new ideological course, choosing instead to peddle the traditional DPJ solutions to Japan's problems -- as though the Global Financial Crisis and Abenomics had not reshuffled the world's and Japan's decks. The problem with replacing Kaieda with someone else is...who is going to be that someone else? If the party is going to press him to go, it has to make a clear, clean break -- or else the exercise will look like what it is, a desperate attempt to generate interest in the party through a coup. Kaieda comes from the DPJ's liberal wing, so reasonably the pendulum must now swing the other way, with a new leader selected from out of the party's conservative wing. Unfortunately, none of the handful of top conservative candidates for the party leadership -- Noda Yoshihiko, Maehara Seiji, Edano Yukio, Gemba Ko'ichiro, Azumi Jun and Okada Katsuya: a collectivity the Yomiuri Shimbun refers to "The Gang of Six" -- has significantly greater electoral appeal, intellectual flexibility or party support than Kaieda. Former prime minister Noda has the gravitas. He has not, however, shed the status of "Class A War Criminal" he earned throught his inexplicable calling of the House of Representatives election of December 2012. Maehara is derided as an LDP clone and is always reminded, when he makes noises about challenging the leadership, of a little incident involving a fake email. The younger or at least younger-seeming trio of Edano, Gemba and Azumi have failed, over Kaieda's year of trial, to create the impression they are more than just former ministers and power brokers of the DPJ's fat years. This leaves Okada, the stolid and fabulously wealthy (Link) veteran who led the party to ignominious and overwhelming defeat in the 2005 summer snap House of Representatives. To be fair, Okada had the misfortune of being asked to outsmart and outmaneuver the greatest political wizard of the age, Koizumi Jun'ichiro. This Okada failed to do -- even though Koizumi, by expelling the postal reform rebels from the LDP and running candidates against them, was fighting the election on two fronts. Like a white Toyota Corolla, Okada was sensible and dependable and safety conscious and simply got blown off the road by the red Ferrari that is Koizumi. Okada has been feisty and crisp, however, in recent appearances. He forcefully pinned down the prime minister, for example, in the debate over collective self defense (Link). He has for the past few weeks been making a lot of reasonable-sounding noises about the necessity for a change in the party leadership, creating the impression he has decided he should be Kaieda's replacement. 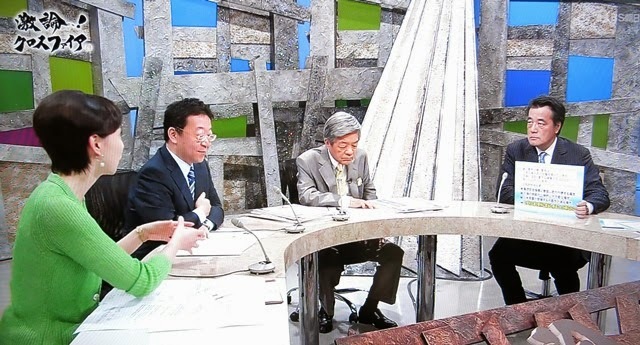 In something of a dress rehearsal for a leadership challenge, Okada appeared this last Saturday on Tahara So'ichiro BS (not what you think) program to debate the Cabinet Decision on collective self defense. His debate opponent was Watanabe Tsuneo -- not the all powerful Abe-supporting media emperor Watanabe Tsuneo, the Japan Foundation's quiet researcher Watanabe Tsuneo -- who is also the son of DPJ elder statesman and legendary quote machine Watanabe Kozo. The bad news from Saturday's debate? Even against a friendly or at least neutral opponent (Watanabe has no political ambitions -- he refused to take over his father's seat in the Diet after his father retired) Okada could not debate the issues effectively. Time after time Okada would toss up a point only to sit morosely and watch Watanabe swat it back. Losing a debate on a minor cable channel against a researcher would not be such a big deal. However, Okada's talking points were for the most part spot on correct. Watanabe's were, by contrast, largely non-sequiturs. If one cannot smash an avuncular BS (what you are thinking) spewing individual who feels no particular emnity toward you, then you are not ready for prime time. Okada has got to be hoping his friends and allies were not watching on Saturday. From the Twitter feeds of DPJ types and unfortunately for Okada, it seems that they were. So don't be surprised if the big development at the DPJ headquarters today is Kaieda surviving what should be a lethal general meeting. Kaieda is terrible...but his potential replacements are not much better. Instead of Kaieda offering himself up for the good of the party, it is party secretary-general Obata Akihiro who offing himself (Link - J) ostensibly to try to make amends for what a lousy leader Kaieda has been.